You are here: Home / Doing research / Are you thinking of doing a doctorate? / Who does doctoral research in the UK? A diverse group of people undertake doctoral research in the UK. Much of the information on this page comes from a recent review of UK postgraduate study by the Higher Education Funding Council for England. Bear in mind that profiles can vary strongly by institution and, especially, by discipline. For more detailed insight into the diversity of UK postgraduate researchers, the Equality Challenge Unit produces useful digests. 60% of doctoral researchers in the UK in 2011/12 were UK domiciled, the other 40% were from other countries. This varies with discipline, for example, within the sciences there tends to be a higher proportion of European Union (EU) or international researchers. It also varies by mode of study, for example a higher proportion of part-time doctoral researchers are from within the UK. Not everybody enters doctoral research immediately after a first or masters degree. Far from it. In some disciplines the majority are 'mature' researchers and many have spent years in a prior career before pursuing doctoral research. Doctoral researchers from outside the UK, particularly in the sciences, also tend to be somewhat older than the UK average, and a higher proportion of them have obtained a masters degree prior to their doctorate. This chart shows what full-time doctoral researchers in 2010 were doing the year before they started their doctoral programme. Nearly a quarter overall (and around a third of social science researchers) came into a doctorate from long-term employment. These statistics were for full-time doctoral researchers only. Far more of those studying part-time are likely to have progressed from employment - in fact most of them are probably still in employment. 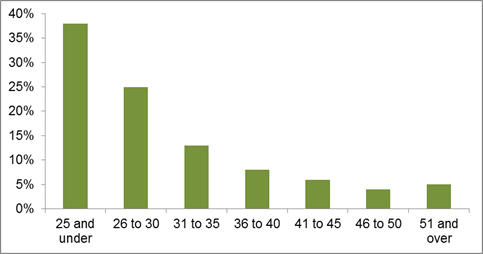 The following chart shows the distribution by age of all recent doctoral researchers (full and part-time). Over a third are aged 25 and under, but over 20% are in their thirties and 15% over forty. The profile for those studying part-time is significantly different, with 40% being over forty. Conversely, about half of full-time doctoral researchers are 25 or under. The number of male doctoral researchers in the UK slightly exceeds the number of females (53% to 47% in 2011/12), but the balance has gradually been shifting towards equality over the last ten years. However, this balance varies strongly with discipline, and in many disciplinary areas females are in the majority, such as biological sciences, biomedical sciences and medicine, languages and education (see the chart below). In physical sciences, engineering, maths or computing, and to a lesser extent business-related studies, males dominate numerically. Slightly more than half of all part-time doctoral researchers are female. Amongst UK national postgraduate researchers, about 83% are white. 17% are from a range of different minority ethnic backgrounds, which is slightly lower than for the undergraduate population. There has been some increase in the proportion of doctoral candidates of ethnic minority background, as ten years ago it was 12%. Again, this varies to some extent by discipline; in medicine, engineering, business and law, about a quarter of UK national doctoral researchers are of ethnic minority background. About 60% of current doctoral researchers are in the sciences (including medicine and engineering), with just under 20% in the social sciences and slightly fewer in the arts and humanities. Within the sciences, the largest broad subject grouping is physical sciences and engineering, as seen in the chart below. Just over two thirds of all current doctoral researchers in the UK study full-time. On the other hand, the majority of those who are aged over 30 are studying part-time; only 10% of them are 25 or under and nearly 40% are over forty. All UK universities have the right to award doctoral degrees, however, doctoral programmes or researchers are not uniformly spread amongst the universities. About 60% of doctoral researchers are concentrated in the universities that are members of the Russell Group, but the pattern also varies by discipline to some extent. Some doctoral researchers may be based at a research institute, particularly in the sciences, but will be registered for their doctoral degree at a specific university. The growth of collaborative doctoral training programmes has created a shift in the distribution of those undertaking full-time doctoral programmes, with a greater concentration in those institutions able to offer these arrangements. Part-time doctoral researchers are more widely distributed. What is common to all these diverse people studying for doctoral degrees is that they are all passionate about and highly committed to developing new knowledge in their chosen research area.